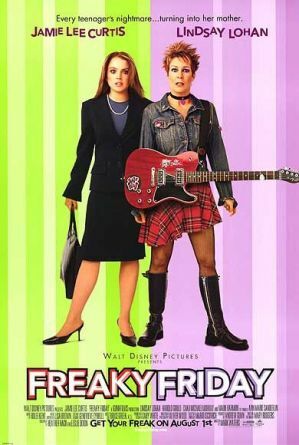 Much of the 2000s flew right by me, and upon finally watching Walt Disney’s Freaky Friday I never really understood exactly how much I ignorantly passed by. A barrage of teenage comedy films. Questionable fashion fads. Normal Lindsay Lohan. But while these things may have been a thing of the past and I now live in a completely different world, I thoroughly enjoyed this family comedy for what it was – a heartwarming, albeit whimsical, story about family ties. I’ve always managed to scroll past this film when browsing the listings on what I should watch next. I’m a very big horror junkie, and so I never really payed any attention to a Lindsay Lohan (Mean Girls, The Parent Trap) film until I noticed Jaime Lee Curtis (Halloween, A Fish Called Wanda) was also in it. Seeing as I absolutely loved the Halloween series, I gave it a chance. I was not disappointed. Anna Coleman (Lindsay Lohan) and her mother Tess (Jaime Lee Curtis) couldn’t be anymore different – while Tess is an uptight mother trying to keep her family in line, Anna is a rebellious, rocking teen. Really, the only thing they seem to share is… arguing and fighting. On a visit to a Chinese restaurant they’re at it again, fighting, until an old Chinese woman (Lucille Soong) offers them fortune cookies. Unfortunately (heh), the next morning not all is at it should be, as both mother and daughter find they have switched bodies – and must learn to walk in each other shoes. I’m not sure if I’m starting to enjoy comedies a lot more, but I had a great time watching Freaky Friday. Yes, while the premise is more common than it should be, and the strained mother/daughter relationship a tad cliché, the film is more than deserving of praise for the amazing Curtis/Lohan performance. They seem to work well off each other, and both did a great job in portraying the other’s character. Props definitely go out to JML though: my eyes were glued to the screen whenever she was on it. She was vibrant, exciting, and most importantly, genuinely funny. It amazed me when I found out she was put on the cast only four days before filming, which made me all the more impressed with her performance. Other than that, dialogue in the film was above average at best and average at worst, and the rest of the film pretty much plays out on that line. The supporting cast does well to compliment the unique personalities of the mains, and a very special mention goes out to Lucille Soong for making me burst out in laughter at the end scene. I have to say, I quite enjoyed a taste of early 2000 Disney. Freaky Friday overall was a great film to pass my Sunday morning, and I have no regrets about watching it. Oh, except for the music video-esque performance by Lindsay at the end – yeah no, I cringe at those things, really, skip right past it and onto the scrolling credits. But other than that, I suggest you don’t do what I did – don’t hesitate! Enjoy this fun and heartwarming film that is sure to leave you laughing.